Denise Bibro Fine Art in Chelsea presents New York artist Don Perlis’ fifth solo exhibition New York Now, February 11 – March 26, 2016. Perlis presents two of the city’s most prominent venues: Time Square and the New York subway. He depicts the landscape and spectacles within these venues that are emblematic of this one of a kind place that we call Manhattan. Perlis has his palm on the pulse of the city. 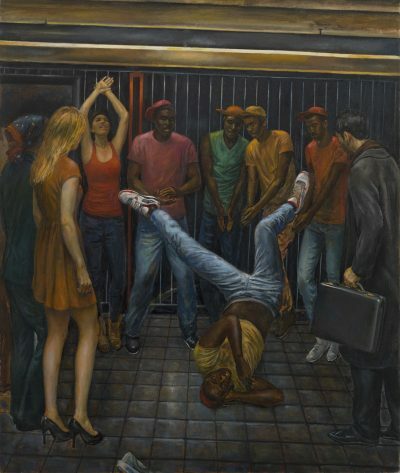 With his classically painted canvases, beautifully crafted, richly colored and structured compositions, he captures the gritty, socio-economic strata, humor, and sometimes sinister qualities of our city; arguably, New York City reflects much of the world and its platforms. Perlis successfully illustrates a city that is busting with visual stimulation— signage thrusts off the canvas, figures dance and swing from poles, animated life-like figures from our film and political world are moving through—connecting and interacting with the crowds. Many depicted characters have become iconic figures in the American Landscape. Each present and reflect the various aspects of life that exist today. This energetic presence compels the viewer to become a participant. The structured landscape and happenstance of New York begs one to explore, to be on the move, to experience. Like many of his characters, Perlis is a provocateur as well as a presenter. The variety and seer quantities of objects, characters, and people, as well as the various platforms of thinking presented and suggested are limitless. Perlis’ modernist landscapes depict wide-scale transformations of the past, bringing to mind similar-minded early twentieth century artists from the Ashcan School like Everett Shin, George Bellows, William Glackens, Robert Henri, George Luks, and John Sloan. These artists also successfully captured the pulse of New York City life. Perlis earns the right to be talked about within the company of these masters. Perlis has had numerous solo and group exhibitions. 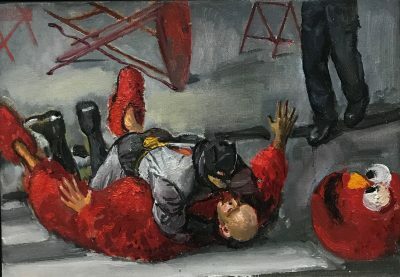 Recently, he has exhibited at the Lancaster Museum of Art, PA, the Heckscher Museum of Art, NY, and the Hoyt Center for the Arts, Newcastle, PA. Among the many institutions he has exhibited are the Whitney Museum of American Art and National Academy of Design in New York, where he is a member and others. His works are in numerous private and public collections including the Corcoran Gallery of Art, Washington, DC, the Kingsborough Community College, NY, Minneapolis Institute of Arts, MN, and the Colby Museum of Art, ME to name a few. He has had received various fellowships and honors, and has been published in The New York Times, Art in America, the New York Magazine, and others. Available for purchase: Don Perlis: Color illustrated catalogue featuring the introduction by Oscar-winning actor F. Murray Abraham with essays by noted Art historian/Art Critic Donald Kuspit and Art Historian Stanley Grand.